A solo exhibition by internationally renowned Indian artist Shilpa Gupta opened in YARAT Contemporary Art Space on July 7. A press tour for journalists was held as part of the event. During the press tour the media representatives were informed in detail about the concept of the exposition. Prominent public figures, famous representatives of culture and art attended the openning ceremony of the exhibition. Addressing the event, art director of YARAT Suad Garayeva-Maleki noted that the presented works were prepared specifically for the Space of Contemporary Art YARAT, so the exhibition is of particular importance. After the exhibition in Baku, part of the exposition will be presented at the Edinburgh Festival of Arts. It was stressed that for the first time the exhibition of YARAT will be presented at one of the prestigious European festivals. 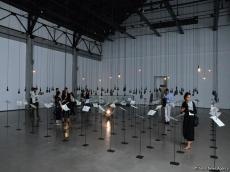 The exhibition curator Björn Geldhof said that exhibition presents a new, large-scale multi-channel sound installation which gives voice to 100 poets who have been jailed over the centuries for their writing or political alignments. Indian artist, for his part, expressed gratitude to YARAT Contemporary Art Space, stressing that this joint cooperation is a great creative experience. Running across the entire first floor gallery space, 100 microphones are suspended above 100 metal rods, each piercing a page inscribed with a verse of poetry. In turn, a single microphone plays these verses, echoed by a chorus of the other 99. Lasting over an hour, the sound piece alternates between English, Spanish, Arabic, Russian, Azeri and Hindi, amongst other languages. A chorus of voices shift across the space, forming an ongoing sequence of haunting recitals. The title of the installation, For, in your tongue I cannot fit – 100 Jailed Poets, is based on a poem by 14th century Azerbaijani poet Nesimi. Alongside this major new work are a series of drawings and objects which reflect upon the lives of the poets, including a mouth cast in metal, a drawing made with thorns and tracings on paper around the body of the missing person. Telling stories of deep conflict and endearment, the works explore the political and societal restrictions which seek to control and clamp both the imagination and the physical mobility of the poets. A motion flapboard, typically found in transit zones and transport hubs to communicate timings and schedules, hangs from the ceiling. Subverting its intended function, Gupta replaces informational text with poetry which describes processes of arrival and departure, and the movement of people and ideas. As the split-flap display rotates, new words and prose appear, offering poignant and timely reflections which in turn lead us to question how we define identity through place and time. For this exhibition, the artist revisits her photographic series, ‘Don’t See Don’t Hear Don’t Speak’ (2006) to create a sculpture in which three identical people encircle one another, each concealing the other’s eyes, ears or mouth. Based on a Japanese proverb made popular by Mahatma Gandhi, the work sits within the context of our current changing political landscape and recent wave of separatism – a present force in the artists own home country, where agencies are often suppressed for their views. Creating a potent dialogue with the other pieces in the exhibition, Gupta’s sculpture offers a powerful reflection on freedom of expression. The artist continues: “Time and again, like where we are at today, voices of truth cause discomfort and stand truncated, however the resonances stay and they continue to be heard". Gupta’s sound installation is a joint commission by YARAT Contemporary Art Space, Baku and Edinburgh Art Festival. This exhibition is curated by Björn Geldhof. Shilpa Gupta (b. 1976, Mumbai, India) lives and works in Mumbai, where she studied B.F.A. Sculpture at Sir J.J. School of Fine Arts, graduating in 1997. Gupta’s work has exhibited around the world including the Venice Biennale, Berlin Biennale, Tate Modern, Centre Pompidou, Solomon R. Guggenheim Museum, Devi Art Foundation, San Francisco Museum of Modern Art, and Mori Museum amongst others. The exhibition will last until September 30, 2018.